There have been many inspirational stories about Appalachian Trail hikers, but in honor of Women’s History Month, I want to highlight Emma Gatewood. Born in 1887 to a Civil War vet Ohio farmer, she was one of 15 children. She married Percy Gatewood and had 11 children of her own. Over 30 years of marriage, she endured serious physical abuse from her husband. But she managed to get a divorce, a much more difficult task at that time. When her children were all grown up, in 1955 at the age of 67, she set out to hike the Appalachian Trail alone – the first woman to ever do so. It took her 146 days and she wore through six pairs of sneakers. A pioneer of what is now called ultra-light hiking, she carried only the barest of essentials, and often received Trail Magic from locals who helped her along on her journey. 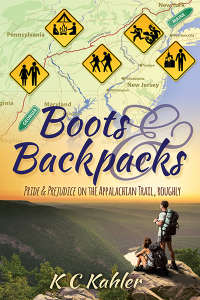 Her hike made her a national celebrity, and brought much-needed attention and interest to the Appalachian Trail, which had fallen into disrepair and neglect. She hiked the AT twice more in her lifetime, making her the first person, male or female, to thru-hike it more than once. She also hiked 2000 miles of the Oregon Trail and was instrumental in establishing the Buckeye Trail in Ohio. At the time of her death in 1973, she had 24 grandchildren and 30 great-grandchildren. In short, she was amazing. To learn more about her inspirational story, see this Washington Post article, or read the biography written by her great-great-grandnephew, Pulitzer Prize finalist Ben Montgomery. I highly recommend Grandma Gatewood’s Walk: The Inspiring Story of the Woman Who Saved the Appalachian Trail. Another great tip! Now how about writing another book!